For his 10th birthday on Nov. 28, Matthew Garr of Shawnee, Kan., asked his friends to bring unusual presents to his birthday party: money for a 10-year-old girl his family sponsors in Guatemala. 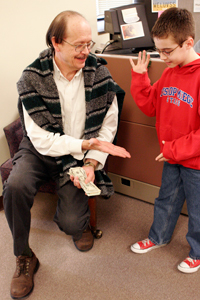 Matthew delivered the money he raisedó$500 in cashóin person to Paco Wertin, CEO of CFCA. Matthew was accompanied by his mother, Debbie, and younger sister, Erin. The Garr family has sponsored Magdalena for about four years. This is the second year Matthew has raised money for her at his birthday party. Last year he collected $303 and Magdalenaís family used the money to purchase a bed, a kitchen countertop and sink, and household supplies such as soap. Watch last year’s video of Matthew’s birthday gift. Blessings on you Matthew; you begin life well. Dear Matthew—we hope you had a great 10th birthday. We are very proud to know you and your family.! This is such a wonderful thing you are doing!